Every little girl loves hair clips and, being the fashionistas that they are, every little girl likes to have lots of different ones. A girl couldn't possibly show up at a Valentine's Day party without a heart shaped barrette in her hair! Having made them for many years for my daughter, and out of a variety of materials, I found that felt was my favorite textile to use, and I always went back to it when I made a new clip. Available in practically any color you could want, felt is a wonderful medium to work with. It's easy to cut, easy to sew through and easy to manipulate. To me, working with felt is like coloring a picture with crayons. Adding an embellishment, like a button or a bead, adds even more interest to a piece. Some of the perks of making your own hair clips are that they can be any design you want them to be, they save money and they are a great way to use up scraps. They are also useful, and I always like making crafts that will get used and not tucked away in a box somewhere. 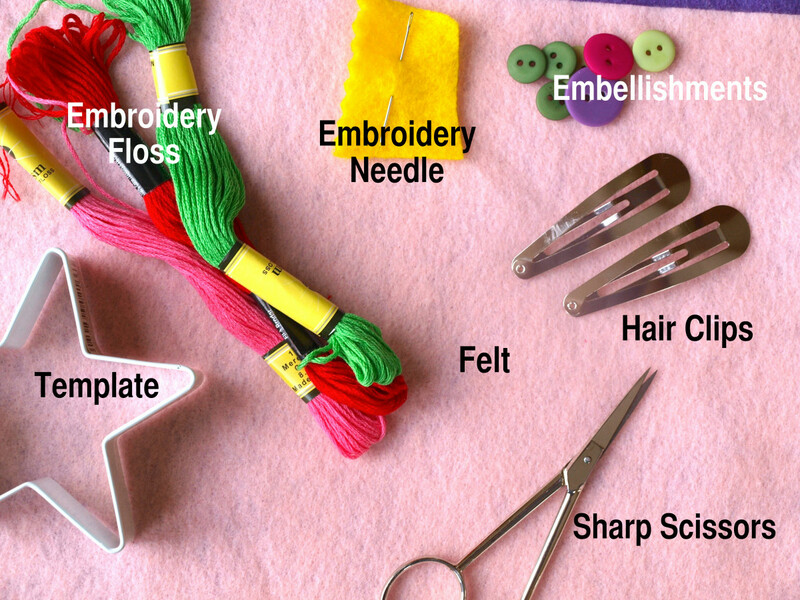 If you need a special gift for a young lady, try making her a one-of-a-kind hair clip using these easy steps. Felt can be purchased online, in craft stores, or in some larger stores that have a craft section. Felt purchased in fabric stores is usually sold by the yard and it tends to be sturdier than felt purchased at other stores. Hair Clips - These can be purchased at almost any store that sells hair products or craft supplies. Sharp Scissors - I recommend using embroidery scissors with sharp points. They make it easier to cut tight angles that may be in your design. Template - I use cookie cutters as templates. They are sturdy and easy to trace. They also come in fun shapes. Any template can also be used, or you can sketch your own design. If you are confident, cut out your shapes without any template. Embellishments - Have fun with these! Ribbons, buttons and beads are just a few things that can be used. 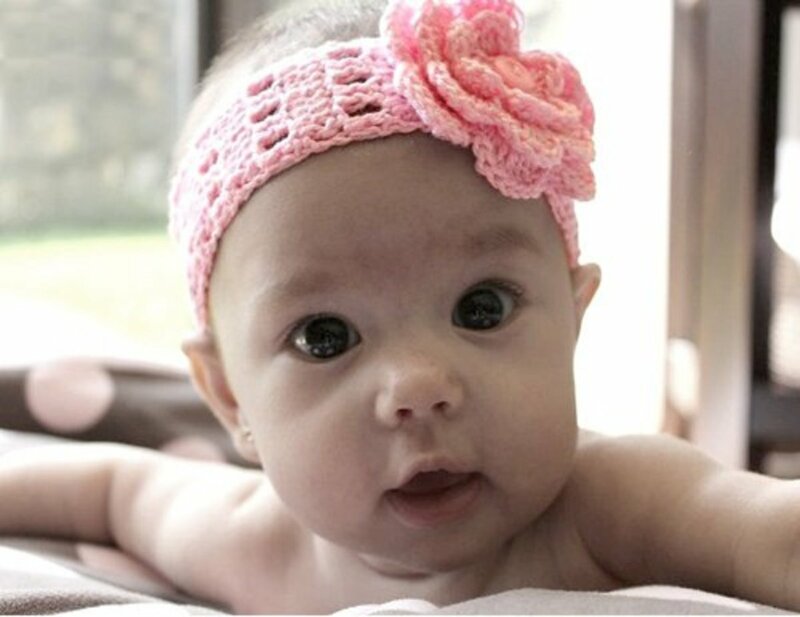 However, if the barrette is for a younger child, don't use embellishments because they can present a choking hazard. For demonstration purposes I used a contrasting floss, but you may want to use a coordinating color so it blends in with the felt. I like to use 4 strands of embroidery floss when sewing with felt. Not only does the stitch work work show up more prominently, it's a bit more secure. Use whatever amount you prefer. Cut a rectangle that is at least 3 times larger than the clip. Cut a small slit in the felt so the smaller end of the clip can fit through. Snap the hair clip shut. Fold the felt over so that the larger part of the clip is covered. 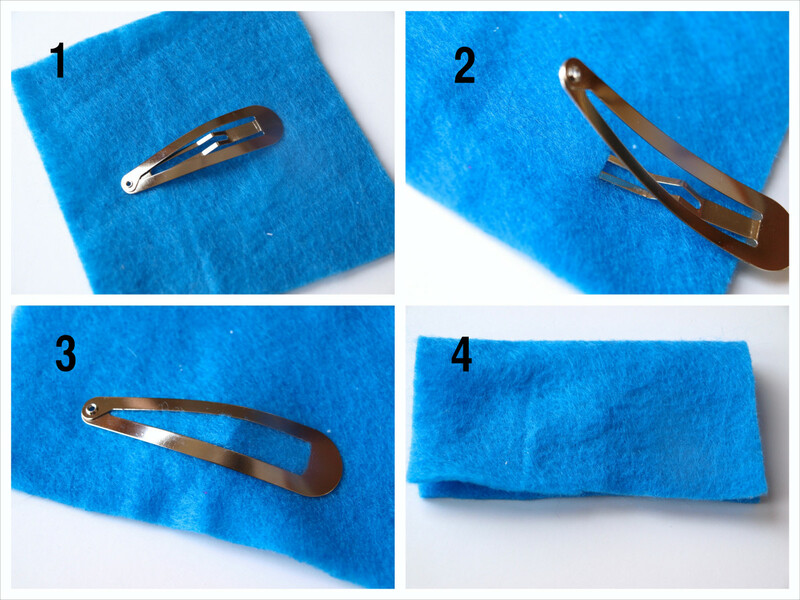 Use a straight stitch to sew around the outside of the hair clip. You will not be able to see it because it is covered with felt. Use the tip of your needle to feel where the outside edge of the clip is. Sew all the way around the outside edge. Knot off and trim the excess floss. Trim around the clip leaving about a 1/8" border. The front is the side the design will be sewn on to. The back leaves part of the clip exposed, which will secure the barrette to the hair. * Remember that once the design is sewn on top, this part of the hair clip won't be seen. Choose the design you want. 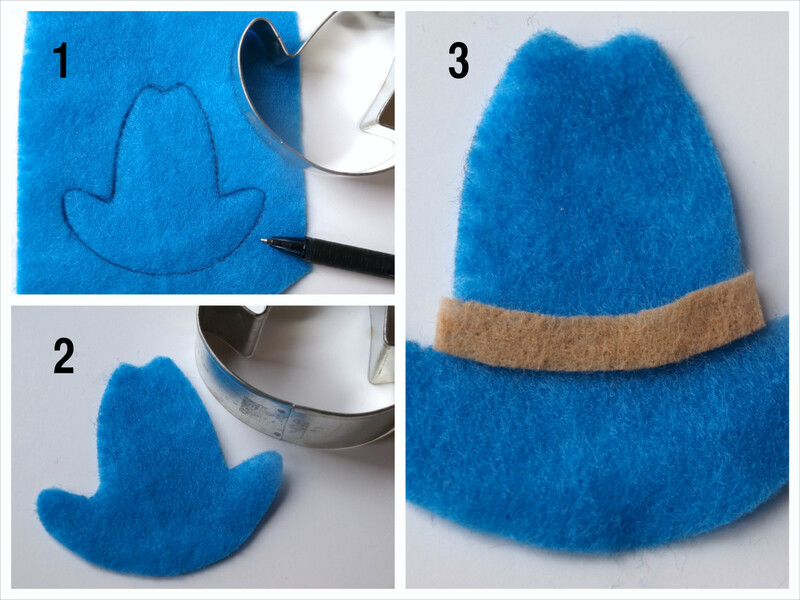 In this case I made a cowboy hat using a cookie cutter. Trace the template onto the felt. Cut out the shape, making sure to cut inside the markings so you don't see them on the finished piece. 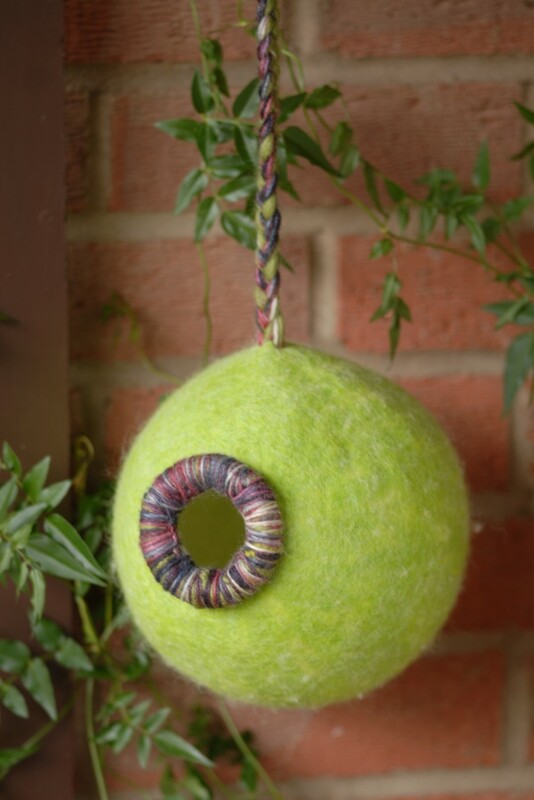 If desired, add other felt pieces to jazz it up. * If you don't want to use a cookie cutter as a template, cut out free form shapes for an abstract design, or sketch out your own template. To sew the design onto the covered clip, place the design how you want it to be. Test out different placements, and how it will work in the hair, before you start sewing. 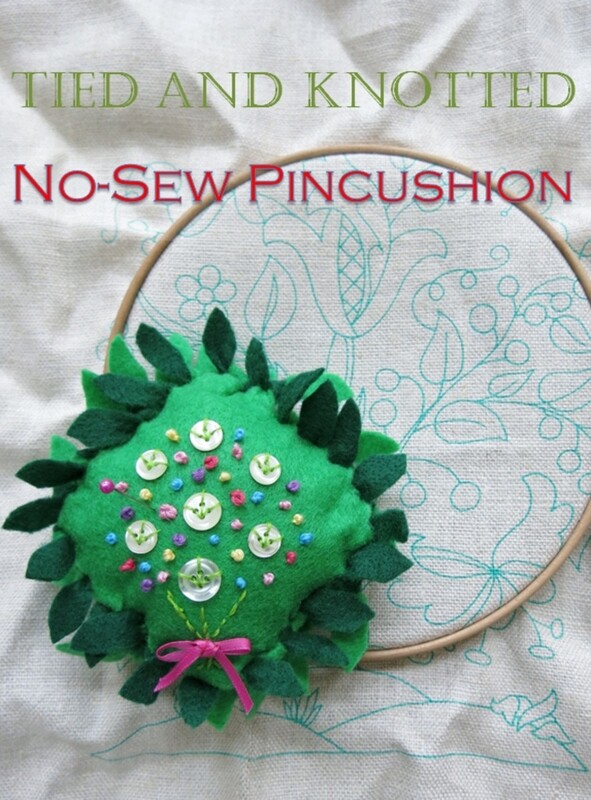 Use a decorative stitch or an embellishment to secure the design to the clip. 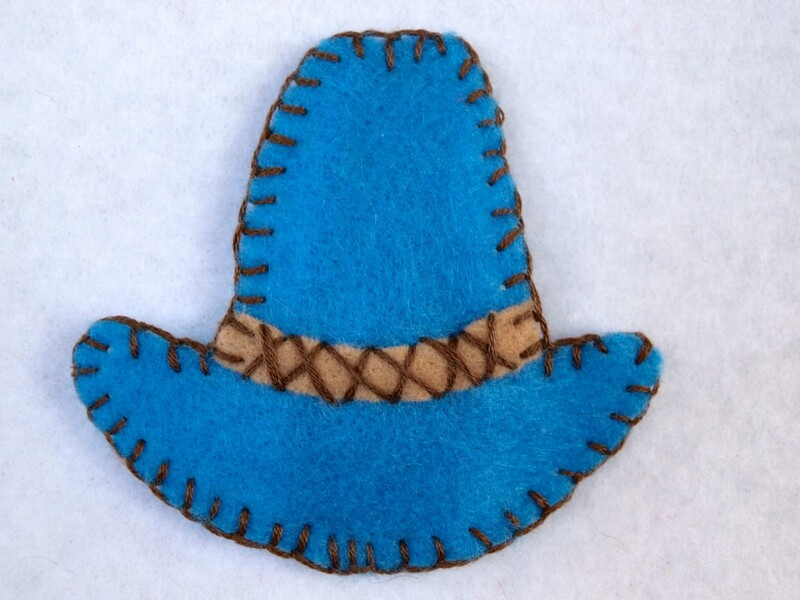 In this example I outlined the hat in a blanket stitch and then used a cross hatch to sew the tan band down. * Always check the back of the hair clip to make sure you haven't gotten the thread wrapped around the exposed part of the clip. It may not open if it gets tangled. Whatever you want to call them, these homemade felt creations are loved by anyone who gets one. They can be made in any size, shape or color and brighten up any outfit. If making them as a gift, keep in mind the age of the recipient. For young children, it is not a good idea to give them a hair clip with buttons or beads on it. It could present a choking hazard. For older children some themes may not be appreciated. These barrettes make great stocking stuffers, birthday gifts, get well gifts, decorations for gift packages or even just a little "I love you" gift. Check out my other designs below and give this project a try when you need a special something for someone. Thank you for all of the support Robie! I really appreciate it and I'm glad you enjoyed this project. My daughter still has these in her hair accessories drawer and likes to wear them from time to time. Hi Margaret - I love these hair clips and I think you are right, the heart would be so cute on Valentine's day. Depending on the age of the child making them, glue could be used instead of needle and thread too. Thanks so much for reading and commenting. I appreciate it. These are so much fun and so quick and easy to make! I think the heart hair clips would make a wonderful Valentine's Day gift (or DIY project) for a little girl. Hi Edna and Earl - Thanks for stopping by and reading. It is a fun project, especially for holidays. Looks like a fast&fun project to try! Dana Tate - Glad you liked the hub and thanks so much for the vote up. It was a fun project to do and now my daughter loves making different ones. Thanks for stopping by! Hi SusanDeppner - So glad you enjoyed the hub and the photos! Also for the blog post shout out. I really appreciate it and I'm glad you liked the craft. It's a fun one! This is a great hub. Very cute designs and beautiful illustrations. Voted up! Cool craft and outstanding photos! Congrats on the HP Blog feature, too! Thanks JackieBlock! I think these would be a fun project for the Girl Scouts and if they are a little young (or uncomfortable) to use needle and thread you could always use fabric glue for certain parts. I'm glad you found the hub useful and I hope your Brownie troop does too! Your clips are so cute! I am looking for simple sewing ideas to try with my Brownie Girl Scouts this year and these may be perfect. I think that they are small enough for beginners while still being something fun! Thanks for sharing these. Thank you Ibidii - I love using cookie cutters as templates. They are such a good resource and I can find almost any shape. Glad you enjoyed the hub and thanks for stopping by! Great ideas! 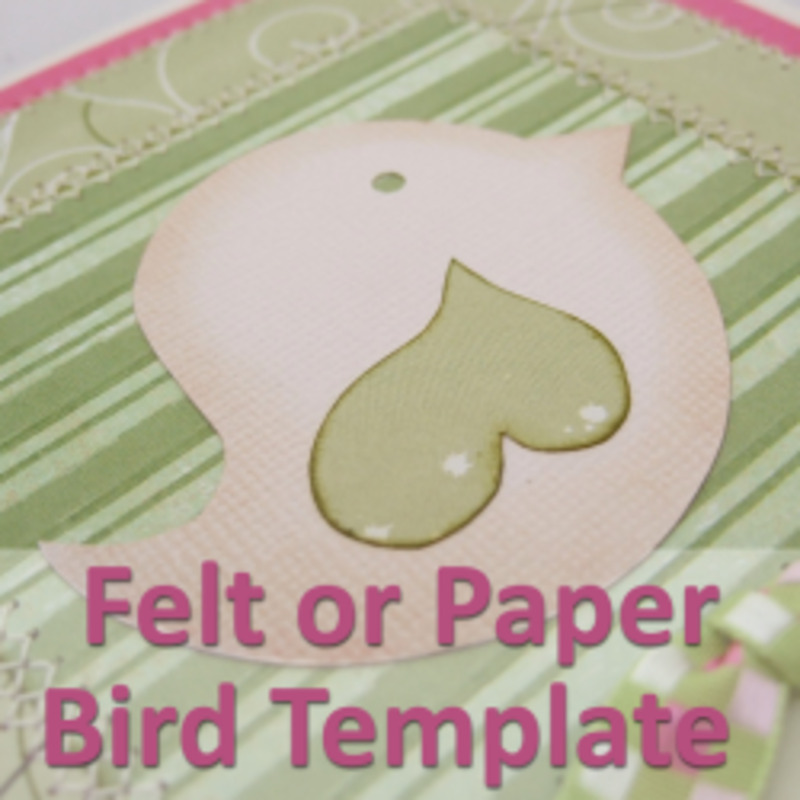 I love all you felt and sewing ideas, especially using the cookie cutters as templates! Thanks Christy! I polled some of my daughter's friends and they all liked the purple leaves. I thought that was interesting because I thought they would like the hearts too. Glad you enjoyed the hub. Thanks for stopping by. Hi Thelma - Good luck finding felt. Not sure where you are, but craft sections of stores usually have some and I have seen it overseas before. Glad you liked the hub. Have a great day and thanks for stopping by. They are all beautiful crafts and an easy tutorial to follow. I might make one of those felt hair clips for my niece if I can find felt cloth where I am now. Thanks for sharing. Have a great week! Thanks aviannovice - A bird pattern would make a lovely barrette. Have a lovely Sunday. Despite our cold nasty weather, I am hearing more and more birds singing when I go out every morning with the dogs. Spring is around the corner. These would make very nice gifts. Great ideas. Thanks very much DDE. I'm glad you enjoyed this hub. Hi epbooks - I bet you could do this. It's a good project for beginners. I like hairclips too. Thanks for stopping by! 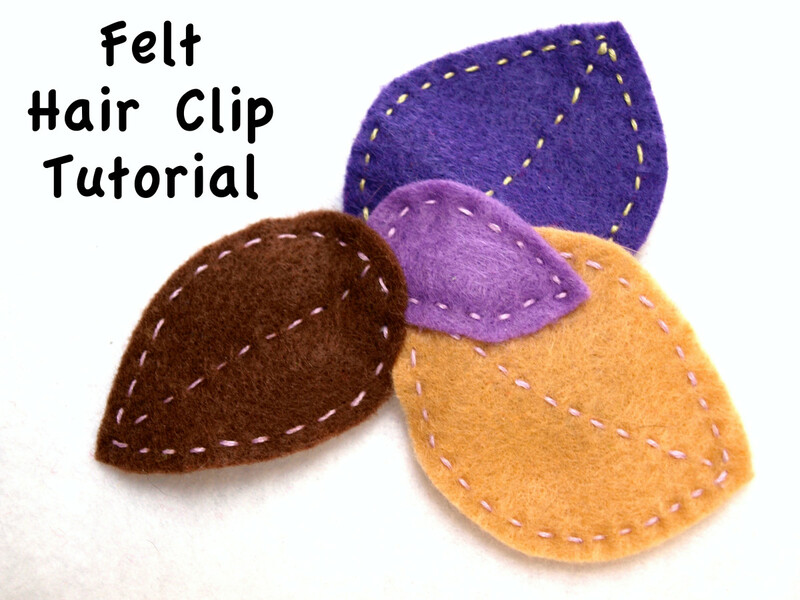 Felt Crafts How to Make a Felt Hair Clip is such a lovely idea and the colorful clip looks so pretty. Very cool, although I don't know if I have the talent to do it. I love hair clips! Thank you ComfortB - I like the hat one too. It's so whimsical and kids can get away with whimsy a little bit better than adults. Thanks for all of the votes. I appreciate it. Aw Nell - thanks so much. I bet you could make one of these. It only takes about 1/2 an hour. Glad you enjoyed the hub. Thanks so much for your support! I appreciate it randomcreative! These are fun to make for any season. I really into felt right now so I'm trying to think of other fun projects. Have a great day! Thanks so much Bill. I tried to make one for every season so I can change out the top photo at different times of the year. I appreciate you stopping by. Hope you had a nice weekend. Pretty, pretty, pretty! I heart your hair clips, especially the heart and hat ones. Very easy to follow steps tutorial. Voted up, beautiful, and useful. You are so clever! and your attention to detail is amazing! it puts me to shame with my impatience all the time! lol! I would not have the patience to even start, but your photos are immaculate too, oh I am so jealous! lol! as we say over here, bloomin' brilliant! Super cute and so simple! Thanks for the detailed instructions and range of options. Hi Glimmer. What a great idea. Very clever. Appropriate for Valentine's Day also. Great hub, easy to follow directions. Have a great weekend. Thanks cclitgirl! I love felt too. One nice thing is that for young kids, the could use glue for this project too and it would be easier. Glad you liked the hub. I appreciate the support. Fun hub! I love trying to make felt crafts - or any crafts. The trick is making it look like an adult actually did it and not a kindergartener. haha! Hi MsDora - Glad you enjoyed the project and I thank you for your kind comments. Thank you so much for the votes and sharing with your students prasetio! I hope they enjoy the project. I appreciate you stopping by and commenting. Thanks kidscrafts! This is definitely something kids could do easily and if other children are like mine, they love using cookie cutters too. My daughter has always had a fascination with them. Have a great day! Amazing! Thank you for sharing this craft with clear instructions and pictures. Voted Up! Thanks so much FlourishAnyway! I'm glad you liked the project. I think a shamrock would be so cute. I was thinking a pastel Easter egg, but unfortunately my daughter is too old to wear a theme like that anymore. Hi teaches - I bet your granddaughter would love them. The Christmas star is the easiest one to do. If you like embroidery you could also add some decorative stitches. Hope you enjoy the project and would love to hear about the results. Voted up, useful and for sure beautiful! Very cute with terrific instructions and enticing photos, as always. You're such a pro. I love the Valentine's theme. I can also see shamrock hair clips?!!? Voted up, useful, and pinning. I may try this with my granddaughter. They are adorable and she would love them. The Christmas star is really pretty. Thanks for sharing your idea. Thanks Ceres Schwarz! I appreciate your kind comments. Hope you get a chance to make one of these some time. Hi Robin - This really is easy and takes about 20 minutes. And hair bows are pricey, especially in children's stores. Good luck and thanks so much for stopping by! VVNess - It took me about 20 minutes from beginning to end to make one. Shorter if you make one like the Christmas one that only has a button and no decorative stitiching. I'm glad you enjoyed the article. Thanks for letting me know! Bill - Ha - I really think you ought to give one of these crafts a try. I bet you'd have fun and they are relaxing. You might be surprised! Thanks so much for reading and commenting. Hope you and your family are well. Hi Jackie - You are right, the plain clips are so cheap and felt is cheap too. These really save a lot of money, especially for people with a lot of girls! Have fun if you make some of these and thanks for stopping by! 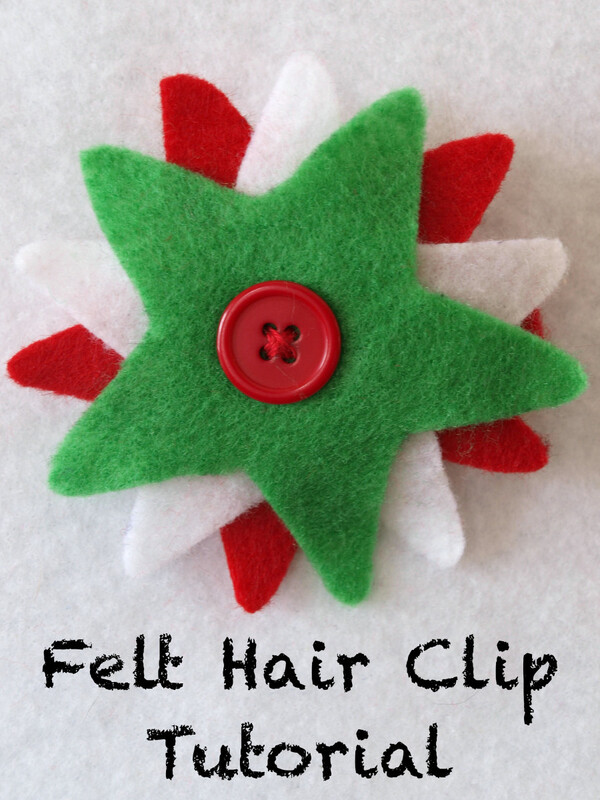 These felt hair clips look really cute and well-made. 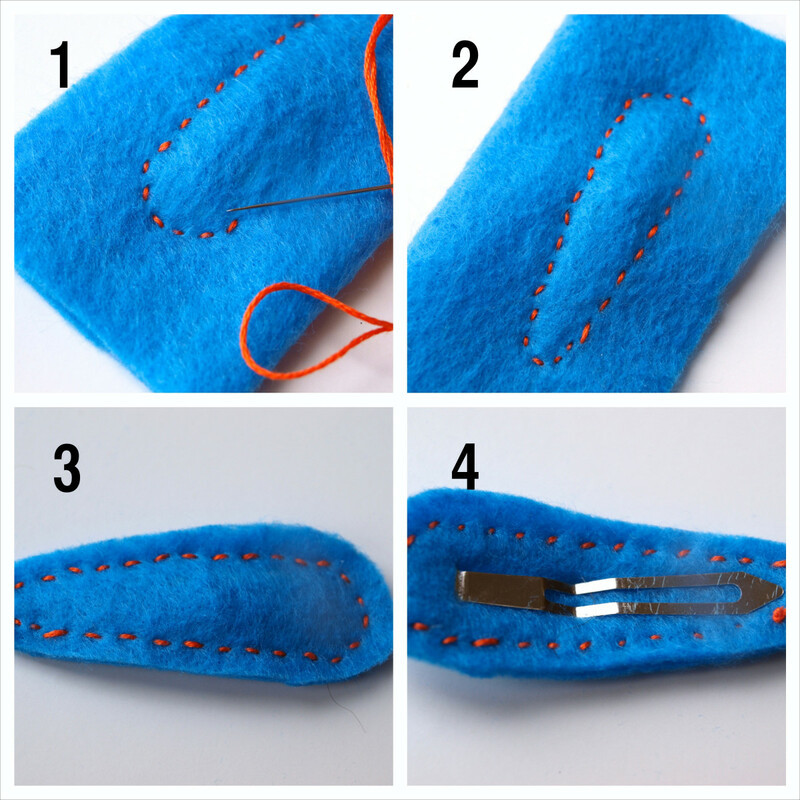 The images showing how to make these hair clips really make it look like it's very easy to make your own felt hair clip. The heart-shaped felt hair clip can be a good gift idea for Valentine's Day. I remember spending a fortune for clips like this for our daughters. You make it look so simple. I think our youngest would like the hearts; I might have to try that! These are very cute, and thankfully don't look like they would take very long to make. Thanks for the easy step by step directions! I love this article! Thank you Suzanne. You really don't need a machine for these. 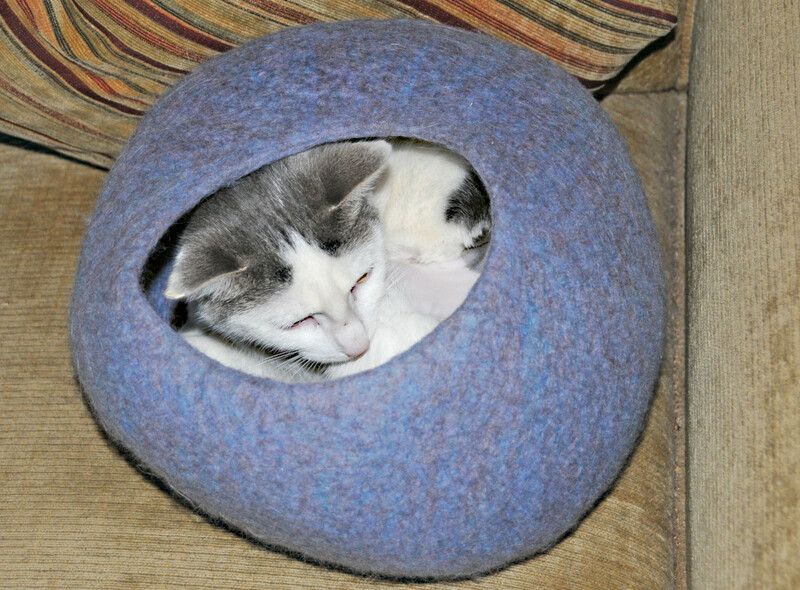 I can hand sew one in about half an hour. Thanks for the votes and hope you make a few for your daughter. I don't want you to take this personally, but I won't be making myself any of these. :) However, the next best thing is Bev's daughter, who very well might try this. Passing it on my talented friend. Thanks purl3agony. It's interesting you like that design. I walk a couple of girls and my daughter to the bus stop each morning and I always like to show them my latest project. All of them liked that one best. I would have thought the youngest one would like the hearts. I think it would look good on a hat too (or one of your gorgeous knit pieces). Thanks for commenting and reading! These clips are so pretty and fun! 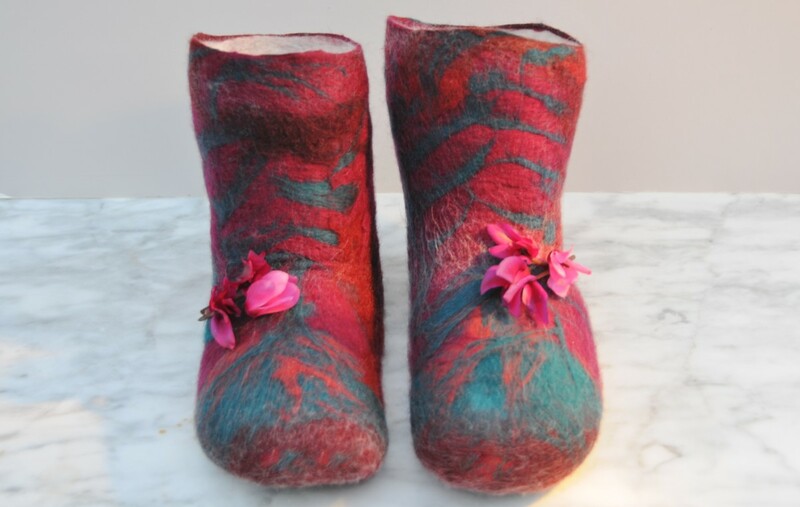 I love the bold look of your stitches against the soft texture of the felt. I particularly like your bunch of leaves. I love leaves and think your design would also look great on a headband or as a little fascinator hat!